See also: Map of Morris County Condo and Townhouse Communities. As pet lovers ourselves, we have a unique understanding of you and your pet’s desires. Morris County has some of the most beautiful parks, some of them especially designed so your pet can safely exercise and play with friends. 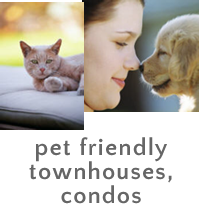 Many Morris County Townhome and Condominium communities have designed their facilities with your pet’s comfort in mind. Also, visit www.TheTownhouseExpert.com for more Morris County, New Jersey Townhomes, Townhouses and Condos for sale.